Now here's a topic that's likely going to change the way you think when you're in a situation where salmon are playing hard to get. Often in Scottish fishing we become far too rigid & robotic as to the way we fish a fly and sometimes it really boils down to a game of opposites if you're trying to get into a salmon's mind. A great friend & mentor of mine big Peter Anderson has the most brilliant assessment of salmon behaviour that I've ever heard. 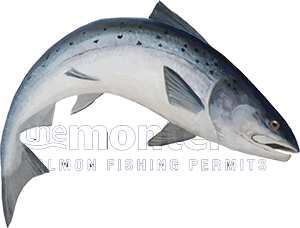 Peter says; "An Atlantic salmon is the easiest fish of them all to catch" then he pauses before saying "sometimes!" That is deadly accurate as all of you will know so what can you do when the going gets tough that could 'wake up' resident salmon that have been totally bombarded for weeks or even months. A blind dog in a snow storm can catch a fresh run sea-licer that's still in full oceanic hunting mode and still in an excitable state of mind about being back in the river like letting your dog back into the house after leaving him out too long! The true acid test in salmon fishing is can you catch the completely 'over fished' educated salmon that has seen every salmon fly in production! This is when you need to have a mind that can think outside the box and your fishing thoughts are 'completely' 100% sub surface. Normally you'll be faced with the above dilemma after or during late Spring when water levels drop and salmon congregate in the pools of a beat which usually always means milder water conditions which makes salmon lie down deep in the pools. Step one is to get that floating line mentality out of your head and put the appropriate sink tip on to get your fly right down in amongst them. If you don't like using a heavy sink tip that's great as the actual aerial fly line water presentation doesn't have to be elegant as that only bothers us and not the salmon. Once you get the depth you must control your salmon fly in a manner that the fish isn't expecting or has ever seen before. If you've got a fly that's tied with materials that waggle and pulse naturally in the water that's great too but additional 'erratic' swim behaviour is the real 'combination to the safe' here. If you're a salmon lying at the bottom of the pool watching a 'cat walk' of salmon flies on a hourly or half hourly basic all 'boringly' slowly sweeping overhead you'd switch off too so waking that salmon up is vital to have any chance of success. All of a sudden an 'erratic' unpredictable low swimming 'fur ball' of Arctic fox and schlappen hackle darts in right close beside you and instantly rips away with a shudder, a stop, another dart and it's gone again! Now you're awake although you haven't reacted in a predatory manner but your dorsal fin is starting to flicker and you've moved off your lie two feet and returned in a more alert state than you've been in for weeks. Immediately again there it is but this time you've been caught 'off guard' with your dander up and BANG! To work a salmon fly to that degree when conditions are tough is hard work to coordinate that with proper riverbank movement which is always essential but much more so when you're trying to 'startle' an old salmon into action. The above fly swim behaviour will get your salmon fly attention if you persevere and especially if you're the first salmon fisher to deploy these 'crazed ninja' deep swimming salmon fly tactics in amongst old educated fish that have been lying doggo in the pools for a while.